The Alf Museum offers a loan kit program for educators of students in grades 2 to 4: the Classroom Science Connections Loan Kit! 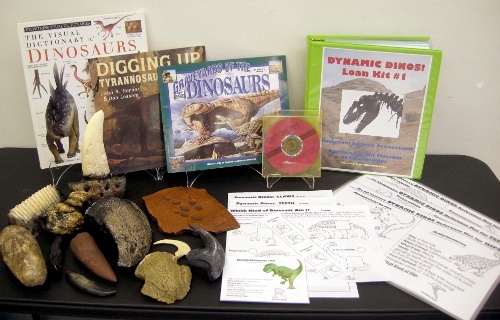 The Loan Kit Program provides teachers with everything they need to bring paleontology to the classroom and to teach major scientific concepts using fossils. The Loan Kit Program gives teachers greater flexibility in how and when they teach paleontology in the classroom; study can range from one day to several days and can lead to extended exploration of the science of fossils and ancient life. Please read and review the Classroom Science Connection Loan Kit Guidelines before beginning your request. Review the Loan Kit Availability calendar below to select a pick-up date (entered on online form). Click here to begin your loan kit request online. Hands-on activity worksheets and materials with instructions provided in the Educator Guide notebook. For more information, please contact Kathy Sanders by telephone at 909-482-5225, or by email at ksanders@webb.org.